But ambient work, with its grandiose scale and unexpected placements, jolts us from our ad-averse reverie and forces us to take notice. Two perfect examples are these beauties from Cossette. 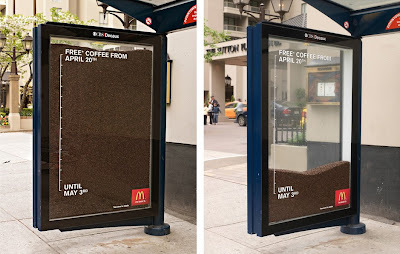 How do you advertise free coffee at McDonald’s? 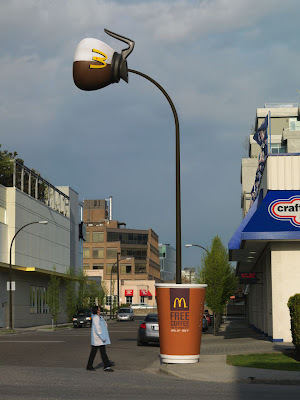 Well, you transform a light post into a pouring pot of coffee. Duh! Seriously, in a thousand years I’m not sure I would have thought to do this. Brilliant. And then there’s this one, which works just as well and has the added benefit of stressing to consumers that time is running out. Everyday the coffee bean count goes down. Again, brilliant. I only hope they don’t actually brew the coffee using these beans. Eck! Click images to see bigger. nice! almost makes me want a cup of coffee … almost. Nice to see some advertisers still care to try to surprise us. Are you in advertising, now? You'd be brilliant at it!